Thirteen-year-old Ting Ting has learned the ancient skills and art of ghost hunting from her adopted grandmother, Por Por, a famous ghost hunter. But Ting Ting is sick of capturing harmless ‘fat belly’ ghosts, and when a desperate plea for help comes for Por Por, Ting Ting decides to take matters into her own hands and prove that she is a true ghost hunter. But what Ting Ting discovers is much more dangerous than she had thought. Can Ting Ting conquer her own pride to save Por Por and the villagers before it’s too late? “(Age: 9-12) Recommended. Themes: Ghosts, Chinese mythology, Sorcery. 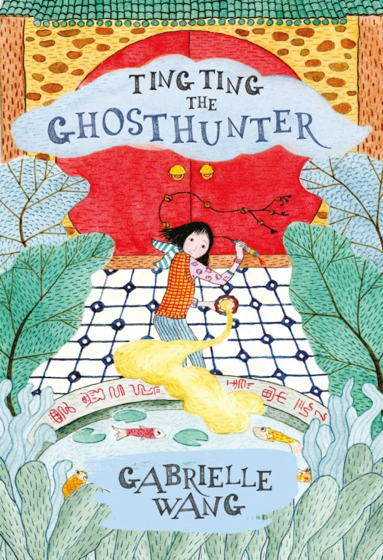 Ting Ting the Ghost Hunter is the much awaited sequel to Gabrielle Wang’s Ghost in My Suitcase. These wonderful stories bring to life Chinese culture, ancient mythology and traditions, focusing on the belief in the supernatural and the art of ghost hunting. Three years ago, a small Chinese lady Bao Min rescued a young girl from an orphanage, taking Ting Ting home to a place filled with kindness and love. Now trained in the special skills of ghost hunting, she travels with her grandma Por around Shanghai capturing problem ghosts. Snake whips, mingshen mirrors, a coin sword and brass bells are used to lure the spirits from their hiding spots. Ting Ting is unhappy with her role just banishing “harmless fat-belly ghosts” and wants to step up to her grandma’s ghost hunting level. When her Por is summoned to Black Band Village for a special job, Ting Ting is left behind trusted to continue her home-schooling and to seal Bao Mansion protecting the house from spirits. She is very fearful of returning here because six weeks ago she was hurt while fighting her grandfather’s ghost. When her Por disappears and doesn’t keep in touch, Ting Ting decides to travel to their Shanghai home and then on to the mysterious Black Band Village. Her journey high into the mountains demands courage, self-reliance, and use of her special skills and trust in the villagers who have been exiled by a den of ghosts. This was my second novel published in 2004. In that story the ghost-hunting grandma known as Por Por first appeared. She was only a minor character but because she was such an interesting character, I wrote A Ghost in My Suitcase . Then, on April 1, 2016, the artistic director of Barking Gecko Theatre Matt Edgerton wrote to me asking if he could adapt my novel for the stage. Well, this is every author’s dream so of course I said yes. It was during the creative development sessions with the two artistic directors, Matt Edgerton and Felix Ching Ching Ho, the script writer Vanessa Bates and set designer, Zoe Atkinson that I realised how strong the character of Ting Ting was. She is the ‘mean’ girl in A Ghost in My Suitcase. But she has her own internal struggles to overcome. She definitely needed to be the star of her own book. And so Ting Ting the Ghosthunter was born. Because I illustrated the cover for Ting Ting the Ghosthunter, I had to illustrate a new cover for A Ghost in My Suitcase. This is my new approach in creating a story. I now do a story board and for me it works really well. With lovely fellow author Leanne Hall who launched my book. My lovely children Ren and Lei Lei who help me so much with ideas and editing for all my stories. They’ve grown up doing this. I couldn’t do without their input. Showing how the art of ghost-hunting is done. I hope you enjoy my novel!